A fitted bathroom is a great way to update your bathroom. Smaller projects can also be used to enhance a bathroom and maximise space. Depending on individual style preferences, a bespoke bathroom for your house can create a modern chic space or evoke a bygone era with a period design. A fitted bathroom can involve any number of elements, including a vanity, a wardrobe or cabinets. Fitted furniture for a bathroom can also be part of a larger project of installing a brand new bath or shower suite. Each component is designed specifically for your space in order to make the best use of the layout and available area. Certain components, such as a cabinet door, might feature a mirror to increase function. Built-in elements can be made from various materials, including wood and metal. They can also be stained or finished in colours and textures that match décor in the bathroom or elsewhere in the house to create a seamless and coherent look. If you live in a heritage property, you will likely choose a bathroom design with period elements. When designing a period bathroom, it is important to match materials and colours with other parts of the home. Reclaimed pieces or reproduced period features may need to be incorporated into the project in order to create an authentic look. Period bathrooms typically feature open shelving, as well as painted floorboards and walls. Contemporary bathrooms feature stylish design elements with clean lines. Everything serves as a focal point, particularly the bath. 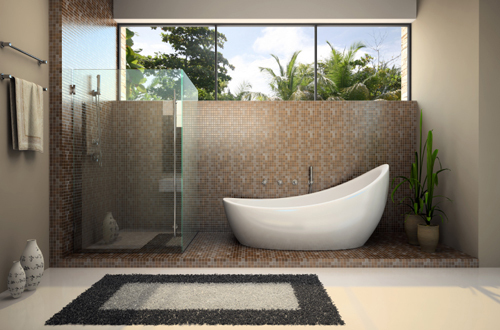 A shower is generally floor-standing with an over-sized showerhead on the ceiling or the wall. Black and white are popular choices in contemporary bathrooms, although they can feature other bold colours. The floor tends to match the colour of the furniture. Other common elements include coloured tiles or glass, and even wallpaper behind glass panels. Minimalist and chic bathrooms inspired by spas are a popular example of a contemporary bathroom design. Every aspect of a bathroom needs to be well thought out when designing a layout. It is important to make the most of the space that is available. Creating built-in storage with fitted cabinets, wardrobes and vanities will help maximise space. Bright lighting and mirrors will also help make the bathroom appear larger. Making the most of the space will help you fit in desirable elements that appeal to potential future buyers, including double sinks and a bath with shower combination. Existing plumbing and electrics will dictate the layout. For example, a toilet must be placed by the soil pipe. Before designing a layout, it is vital that you understand where electrical wiring and pipes are located. If designing a fitted bathroom for a new house, it is equally important to have an eye out to the bathroom's layout when determining where pipes and wiring will be placed. Changing electrics and plumbing could be very costly. Whether you opt for a chain home improvement firm, a national department store or an independent bathroom specialist, there are a few general rules to follow when picking a good contractor. A qualified fitted bathroom installer should be a registered member of the industry and government endorsed Institute of Kitchen, Bedroom and Bathroom Installers. A bathroom fitter is generally a plumber by trade. They should also have experience with tiling and building bespoke furniture, such as bathroom cabinets. A contractor may need to hire experts, such as an interior designer, architecture or electrician depending on what work is needed. Ask potential contractors about their qualifications and membership with any trade associations, and for information about any sub-contractors. Plumber associations include the Association of Plumbing and Heating Contractors and the Chartered Institute of Plumbing and Heating Engineering. Ask potential contractors about previous experience and request to see examples of previous projects. Choose a contractor with a local office, which may also have a showroom where you can get inspiration and ideas for your project. The most trusted contractors will give no-obligation quotes and not ask for upfront payments in full or cash payments. In addition to doing your own research, ask friends and family about any recommended bathroom fitters.